I took a trip to my "Sumner Shack" in the woods off the shore with my friend, who is apparently holding the camera and pissed me off, sneaking photos of me early in the morning before I've even brushed my teeth! So I chased her furiously. Looks like she got it on film. She's not invited next time. Ahhh, basking in the afternoon sun. What a lovely view, standing almost as high as the trees. I can see everything. 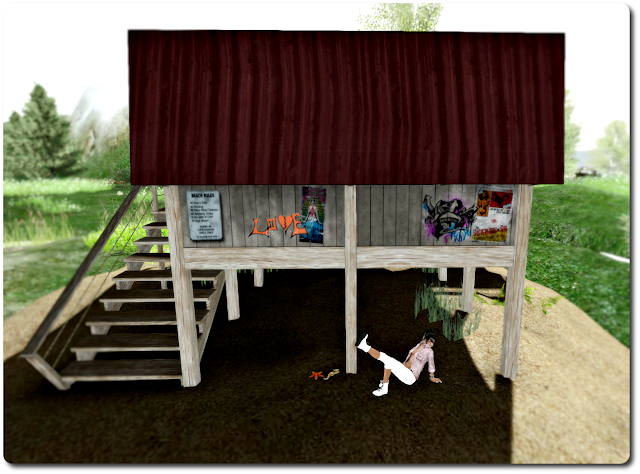 Inside I'm praying this balcony of my "Summer Shack" is sturdy enough for me and my friend. Her head is kind of fat. Ew, the couple down on the beach is kind of grossing me out with the lovey dovey crap. I need a drink. Hmph. My friend and I lounging in our shack, avoiding seagull poop. The sun sets in a peachy color and we've got empty cans of HANDverk beers strewn all over. Ahh what a good summer day!